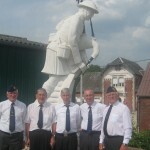 Nine members of the Roger Casement Branch attended the July 1, Annual Remembrance Ceremonies at the Somme. Wreaths were laid on behalf of the Branch at the Thiepval Memorial, Ulster Memorial Tower and at Guillemont. 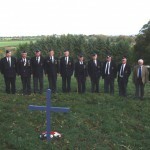 During their recent visit to the Limerick/Shannon area on 20th October members of the Branch remembered the 50th anniversary of the tragic accident to DH Dove 188 which occurred on 27 January 1961. Two Air Corps pilots and two Air Traffic Control Assistants lost their lives in the accident. 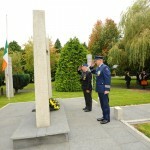 The Annual Mass in memory of deceased members was celebrated by Air Corps Chaplain Fr. Jerry Carroll in Casement Aerodrome on 10th October 2010. The Mass was followed by a wreath laying ceremony at the ONE Monument which was jointly performed by the Branch Chairman Paddy O’Meara and Lt-Col Gerry O’Sullivan, Station Commander.